Ramsey & District Angling Society fished their Bank Holiday Monday match on the high number pegs on the club’s water on the Forty Foot Drain. Top rod was the in-form Keith Rayment. Be it carp fishing on commercial waters or in this case tench and roach on a natural venue, you just can’t keep Rayment out of the frame right now. He weighed in two tench and a good net of small fish caught on the pole with maggot for a level 10lb. Ken Taylor came in second, and he also had a tench in his weight putting 7lb 6oz to the scales . Then came Stu Cheetham on 2lb 4oz in third spot and Vern Edgley in fourth place with 1lb 14oz. The poor weather on Sunday saw a much smaller field for the JVAC club match than usual, but that gave those fishing a bit of extra room, so weights held up well. It’s not often you get big weights and a tie for the top spot on carp lakes but this match saw Ian Frith and John Savage sharing the spoils, both putting 212lb 13oz to the scales. Frith was on peg seven and caught small carp and barbel in the margins on red maggot. Savage was on on peg three and fished a small feeder with sweetcorn for most of the match before switching to the margins late on with meat. Third place went to Roy Whincup with 179lb 15oz catching close in with cat meat. Webb’s AC had a some really good weights in their latest match fished on the Kingfisher Pool at Float Fish Farm Fishery. 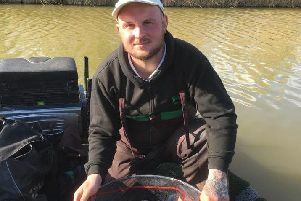 Kevin Peacock topped a small field with a fine 201lb 15oz net, all caught on the pole with meat from peg three. Over on peg seven was John Crouch, who weighed in 147lb 14oz for runners-up spot caught on sweetcorn. Then it was Phil Jones on peg two with 146lb taking third place.